Mix & Match it up! Deciding to choose a Mix & Match pyjama can be perfect! You choose your own sizes top and bottom.... you can also create your own individual style and create a new pyjama! Pastunette brings you all the romantic and feminine qualities from one of your favourite brands whilst Rebelle gives you a fresh and flirty feeling with a younger slender fit and trendy styling. Making your Mix & Match pyjama has never been easier, you have an assortment of pyjama bottoms, shorts and tops which allows you the freedom to choose your own style, whether it is feminine & floral or flirty & fashionable, so why not mix it up a little and go a bit crazy! Go for Pastunette & Rebelle or Rebelle & Pastunette...It is all up to you!... You decide!! A perfect Mix & Match pyjama is not just about the perfect size for you or your individual style.....you can also have those little finishing touches that a Mix & Match Collection allows you the freedom to do, The pefect trendy fleece cape or jacket, luxury house coat or slipper boots. A Mix & Match pyjama will be just perfect with that that special finishing touch added to it! So, why not finish off your Mix & Match pyjama in style! 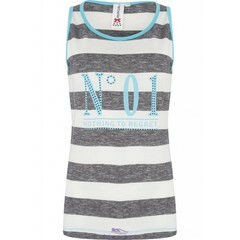 sleeveless striped vest "No 01"